Shen Yun Symphony Orchestra takes you on a musical journey, reviving Eastern musical traditions through a grand symphony orchestra. 공연은 예정대로 정시에 시작됩니다. 공연 시작 전에 착석해 주십시오. The inestimable Stern Auditorium / Perelman Stage has seen innumerable historical concerts and events: The very first opening night in 1891, Horowitz’s sold-out 1965 recital, and Groucho Marx’s 1972 appearance at the twilight of his career are but a few. With five curvilinear levels that seat 2,804, Stern / Perelman has acoustics that have dazzled audiences and performers for over a century. The striking design of the 2,804-seat Stern Auditorium / Perelman Stage reflects both careful planning and remarkable intuition on the part of its architect, William Burnet Tuthill. Tuthill was an amateur cellist and secretary of the Oratorio Society of New York City, but had never before designed a concert hall. To make up for his inexperience, Tuthill extensively studied the science of acoustics as it was known in his day, and with the help of Dankmar Adler, an acoustical specialist, investigated the construction of hundreds of other halls. Based on his findings, Tuthill designed an interior that avoided focal points for sound as it produced an ideal resonating chamber: the interior dome, the high proscenium arch, and all the interior curves were conceived to produce optimum reverberation. Tuthill carefully arranged the boxes and balconies to help break up the even spread of sound, and controlled reverberation with the upholstery of the chairs and the carpeted aisles. The four-foot thick exterior masonry walls, concrete and terra cotta tile construction materials, and interior walls of slow-drying plaster combine to block out exterior sound. The auditorium’s renowned acoustics have made it a favorite of audiences and performers alike. “It has been said that the hall itself is an instrument,” said the late Isaac Stern. "It takes what you do and makes it larger than life.” An extensive renovation in 1986 removed decades of alterations to Tuthill’s design, returning the auditorium to its original understated 1891 splendor. The hall was dedicated the Isaac Stern Auditorium in 1997, and the stage was dedicated the Ronald O. Perelman Stage in 2006. For 24-hour travel information, visit mta.info or call the MTA’s Information Center at 718-330-1234. Take NY Waterway to Midtown/W. 39th Street and then its free shuttle to Carnegie Hall. For 24-hour travel information, visit www.mta.info or call the MTA’s Information Center at 718-330-1234. 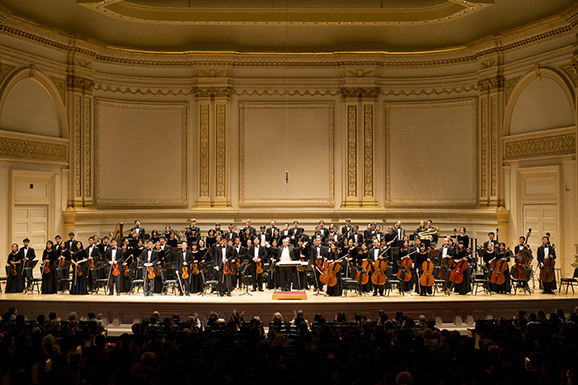 Take NY Waterway to Midtown / W. 39th Street and then its free shuttle to Carnegie Hall. 눈을 감고 먼 옛날, 그곳에서 울리던 멜로디에 몸을 맡겨 보세요. 섬세하고 잔잔한 비파 선율을 듣노라면 어느덧 달빛 아래 무희들이 춤추는 황궁 연회를 만나게 됩니다. 우렁찬 북소리는 용맹스러운 기운 가득한 고대의 전쟁터를 떠올리게 합니다. 션윈만의 독특한 프로그램이 장구한 역사가 품은 소중한 이야기와 멜로디를 되살려 내고 있습니다. 얼후, 경쾌한 비파 등 중국 전통악기들이 서양의 현악기, 목관악기, 금관악기와 유쾌하게 어우러져 세상 어디에서도 들을 수 없는 화음을 만들어냅니다. 작곡에서 제작에 이르기까지 이런 션윈만의 접근법은 화려하고 생동감 넘치는 음악, 폭넓은 감정을 담아내는 음악을 탄생 시켰습니다. 바로 음악적 스토리텔링에 완벽히 들어 맞는 음악입니다. 션윈 심포니 오케스트라는 세계적 성공을 거둔 무용 공연 션윈에서 파생되었습니다. 음악회 형식으로 션윈 음악을 듣고 싶다는 관객들의 요청에 화답해 탄생한 것입니다. 오케스트라에는 서양 클래식과 동양 전통 음악 분야 콩쿠르 우승자 등 세계 정상급 음악가들이 다수 참여하고 있습니다. 2012년 카네기홀 데뷔 무대 이후 전 세계에서 찬사를 받으며 무대를 이어가고 있습니다. 올 시즌 프로그램은 다양한 레퍼토리, 참신한 즐거움, 그리고 박진감 있는 전개를 특징으로 합니다. 클래식 애호가는 물론 클래식을 처음 접하는 분들도 쉽게 즐길 수 있는 곡들로 엄선했습니다. 가장 인기 있는 션윈 창작곡들과 바그너, 사라사테, 차이코프스키 등 서양 클래식 명곡을 함께 연주합니다. Works range from haunting erhu solos to the grandeur of imperial- style marches and the bucolic charm of folk-inspired melodies. "나는 압도됐다. 온몸으로 아주 감미로운 전율을 느꼈다. 그건 힐링이었다."